David Cameron has paid tribute to the lifeboat crew which helped to rescue dozens of swimmers in Southwold last week. During Prime Minister's Questions, he said that the RNLI should be treated as an emergency service after Suffolk Coastal MP Therese Coffey asked him to join her in thanking the volunteers. Hundreds of swimmers got into trouble during the Southwold Pub to Pier swim after the tide suddenly turned. The Prime Minister's given a speech in Ipswich setting out tough new rules for immigrants hoping to claim benefits and get on council house waiting lists. David Cameron said immigrants would have to earn the right to use public services. There's concern though that the announcement could stir up racial tensions in some communities in this region. David Cameron has said he will be introducing a "local residency test" this spring that will mean "local people will rightly get priority in the social housing system". He added: "Migrants will have needed to live here and contributed to this country for at least two years before they can qualify." Outlining his immigration plans, David Cameron has said: "Under the previous government immigration was far too high and the system was badly out of control. Net migration needs to come down radically from hundreds of thousands a year to just tens of thousands." "That means ensuring the people who do come here are the brightest and the best, the people we really need with the skills and entrepreneurial talent to help create the British jobs and growth that will help us to win in the global race." Immigrants face tougher curbs on benefits and access to the health service, under a crackdown unveiled by David Cameron in Ipswich today. 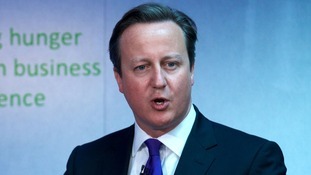 The Prime Minister, David Cameron is in the region today. He will be at a college in Buckinghamshire to mark the start of National Apprenticeship week. According to recent figures, 45,820 people started apprenticeships in the East of England last year, a rise of 15.2% on the previous year. This morning David Cameron is set to deliver his long awaited "Europe Speech".